There’s an Isabel Allende novel in which the main character’s parents have a special brake system for their car. They have a stone attached to a rope tied to the car, which the mother (from the passenger seat) throws out the window when they need to stop. They think it’s fine- they’re one of the first families in town to have a car, and they’re sure it’s a pretty foolproof system. Until they eventually die in an auto accident. But it definitely added spice to the story. We live in the hills of Oaxaca, where the “highways” are all like back-country roads. They’re ridiculously curvy winding roads with steep cliffs at every bend. Only some of the roads are paved, and even when they’re paved, they’re full of gigantic potholes, speed bumps, and other hazards. When they’re not paved, when they’re dirt roads and it’s the rainy season, they can be impassable, or only passable in some kinds of vehicles, and then very carefully. When in that situation, I frequently picture us losing control in the mud and sliding over the cliff, which I’m pretty sure no one would survive. I am a little terrified every time we venture out onto the roads no matter whether the road is paved. But the alternative, to stay in this tiny town all the time, is even scarier to me. 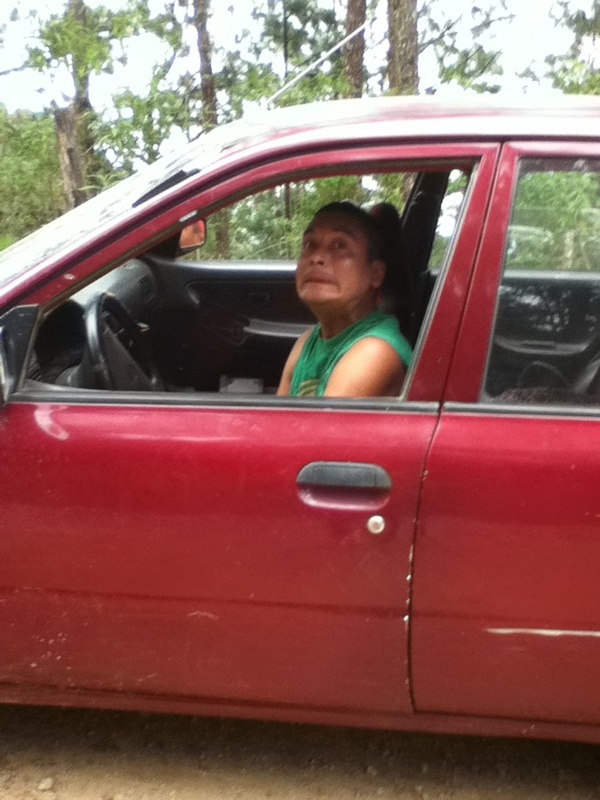 We borrowed a car to go to Camelote. That’s the town where Paulina (my mother-in-law, more or less) is originally from, and where her mother (Conan’s very beloved grandmother) is buried. This seemed like a brilliant plan because a) we could use Lucia’s car seat, b) it would be cheaper, and c) we wouldn’t have to go by the public transport. The transport is not only inconvenient, with only a couple of trips per day, but also it’s uncomfortable, since it is just a double-cabin truck with benches in the back. There’s a hierarchy for who gets the inside seats: women with babies/very small children first, then other women, and only men if there’s still room after that. But no matter where you’re sitting it’s not particularly comfortable. The car would alleviate all of our issues. 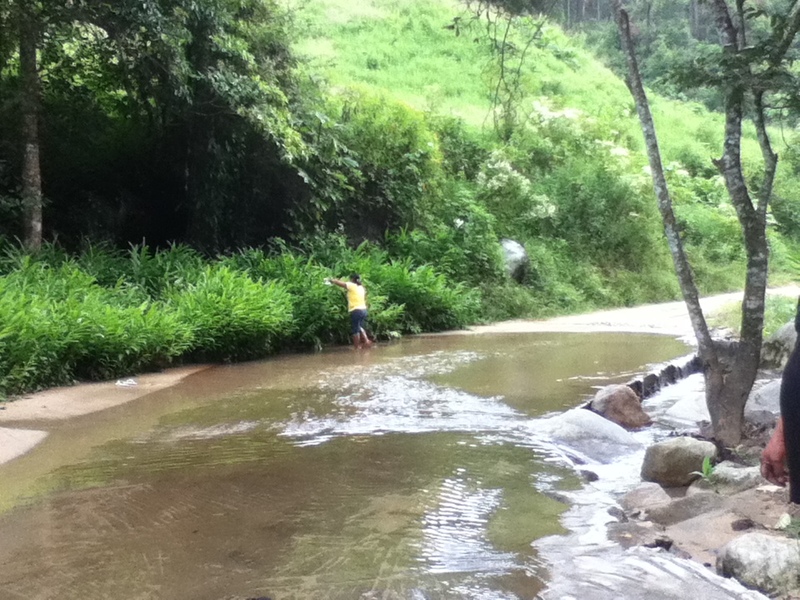 The road to from Juquila to Camelote is a dirt road that’s in particularly bad shape, and worse when it’s rainy. One of the times that Paulina returned from a trip there since we’ve arrived in Mexico, she said everyone had to get out and wade across a river to switch trucks, because the river had risen so high the truck couldn’t pass it safely. It’s only been in Conan’s lifetime that any public transport travels the route regularly. When Paulina was growing up, and even when Conan was young, they’d walk the whole route. I understand that it takes about six hours if you’re in good shape, a bit more if you’re with small children. Driving the route can take anywhere from one and a half to three hours or more, depending on the conditions. Here’s a picture of where the river crosses the road when it hasn’t been raining profusely and it’s safe to cross:. Our first crack in the plan comes when we have the car in our possession and realize there are no seat belts in the back seat. So our plan to use Lucia’s car seat is null and void. Although, after we’re en route and I realize how bumpy the road is, and how slow we go anyway, and the lack of other cars on the road, I feel like the car seat would be harder on her than being in the wrap anyway. But there’s no point in worrying about all that now; I’m too busy worrying if we’ll make it there alive. Paulina’s friend assured us that her car was in good shape, but it doesn’t seem like it. It is making all kinds of noises and it shakes when you go over 10 miles an hour or so. On top of that, there are all kinds of hazards on the road- huge dips, big piles of dirt, large rocks, and all kinds of other stuff you might see on a driving video game in the U.S. “It’s extreme driving!” Conan says, making his voice like a heavy metal singer, but only a little ironically. “This is way more exciting than driving in the U.S.” he adds, telling his mom about the straight, nicely paved highways everywhere. He’s creeping along, and he’s doing a great job. I have tons of confidence in him as a driver. I know he’s just as concerned about our safety as I am, although surely less anxious. But I have zero confidence in the car and the road. I find myself holding my breath. A lot. We’re a little over an hour into the trip when Conan stops the car. “The brakes aren’t working very well.” he says. “Didn’t you check the brake fluid before we left?” his mom asks. “Yes; it was fine.” He checks it again. Still fine. But he’s having to push pretty hard to brake. And most of the route is downhill. I am ready to abort mission immediately- that seems like the only sensible thing to do. But we decide to try a little further. The brakes are still working, after all, just not as well as one would like. But where to leave the car? We can’t leave the car in the middle of the road- even though it is not heavily frequented, it’s a small road so the car would prevent anyone from passing. Even just to turn around, Conan has to find a decent place where the road is wide enough. We decide to go back to such and such spot we’ve already passed, where we can leave the car. Paulina and Conan are sure we’ll make it there, based on the idea that you don’t need brakes to go uphill. But just in case we do need brakes, Paulina grabs a large rock and puts it in her lap. “Just in case,” she assures me. She is prepared to jump out and put the rock behind the wheel if necessary. “Should I get a rock, too?” I ask. “It’s called a brake, Julia,” Conan jokes with me. Paulina says her brake is plenty.